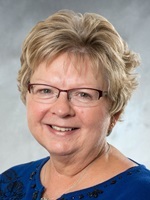 In addition to teaching online nursing courses for Northwestern, Loretta Myers serves as the director of patient care for Floyd Valley Healthcare in Le Mars, Iowa. Her other nursing experience includes working as first a nurse and then the in-house nursing supervisor for McKennan Hospital in Sioux Falls, S.D., and as the director of nursing for the Hillcrest Care Center in Hawarden, Iowa. Myers earned a master's degree in nursing administration from South Dakota State University and a Bachelor of Science in Nursing from Morningside College. (4 credits, 3:1)(Writing intensive) Based on a Christian worldview, this course explores the leadership, management, role development and clinical scholarship dimensions of professional nursing practice, with a distinctive emphasis on promoting shalom, servant leadership, social justice and sociopolitical change. Students will analyze the health care system at a microsystem, macrosystem and chronosystem level, focusing on national health care but also exploring global health issues. Foundational to this exploration is an analysis of the relationship of personal, professional and organizational values and ethics to health care leadership roles and activities. Clinical scholarship is emphasized as a moral duty of Christian nurses committed to continuing Jesus' healing ministry. The practicum component provides an opportunity for students to observe (a) the role played by a nurse servant leader and (b) engage in a leadership project as a basis for clinical scholarship. Learning experiences include service-learning, faith reflection and practicum experiences. Prerequisites: Nursing major with senior standing; NUR420A or NUR440A.